DCRA, the city’s regulatory information agency, today launched a one-stop shop for permit verification, property ownership information and a bunch of other cool tools to find out about what the city thinks about where you live. Want to make sure your landlord has a legit certificate of occupancy for your basement rental? You can check that. Want to make sure the house you’re buying has permits for the construction? You can check that. Give it a spin on your place, see what comes up! You can even check out the 2004 photo, which might be revealing for those of you with newer places. PIVS is part of the new DCRA website that launched in the new DC.gov templates today. Pretty impressive. 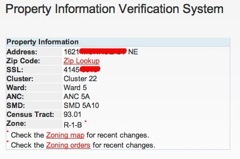 I put in 3700 O St. NW, which is an address that could trip up a search engine like this, but it handled it perfectly.